The recipe for our hand thrown New York style pizza was given to us back in 1974 by a man who had spent his entire life operating a pizza stand in Manhattan. He said, "This put my kids through college, it should do the same for you". To this day, we do everything the way he taught us; get in early, hand roll every dough ball, let it rise for a few hours, then begin creating masterpieces. Classic fresh Mozzarella and Skipolini's Red Sauce. Skipolini's prides themselves in using only the freshest ingredients available. We also offer a gluten free alternative for pizza. 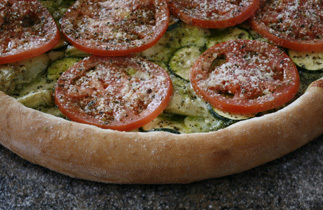 Skipolinis is not a 100% gluten environment but we are able to make your pizza on gluten free crust. Please let your server know if this is an option for you. The Gluten free crust comes only in a 10 inch size and you can choose any of our specialty pizzas to go on it or just create your own! A $3.00 additional charge will be added to the cost of each gluten free pizza. Rice cheese is available as an alternative to mozzarella. Rice cheese is lactose free and made with rice milk. It is not 100 percent vegan because it does contain Casein.